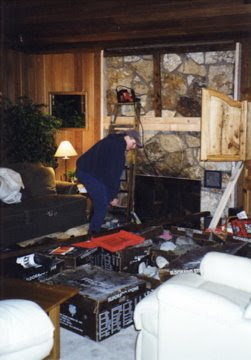 Fireplace BEFORE ugly jagged 70's mustard and gold stone We sure know how to create a good mess! 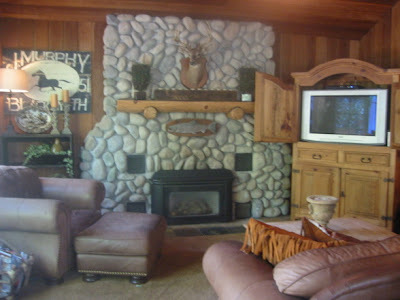 We used a engineered stone in a river rock by Eldorado Stone manufactures. This was going to be my husband's project, but 3 rocks into it, he broke 2 fingers and I had to finish! We also added a gas insert which we love. This was done about a yr. after we moved in. The installation process is given on the website as well! I have admired your river rock (inside and out) since I first found your blog last year. Then I saw the setting on the lake for your home, a huge wow. 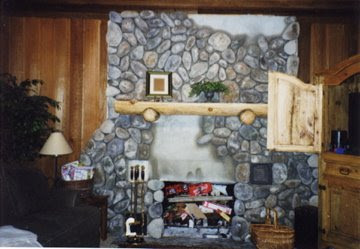 I had a fireplace made from that same ugly rock, only ours had chunks of rock sticking out that our boys could rock climb on.We just ripped off all of the rock, sheet rocked and built a pretty white mantle. I love my fireplace now! 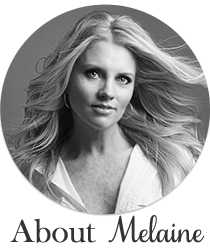 Melaine - all of this posting of your renovation expertise and it finally occurred to me! You want to come do my bathroom! You are such a wonderful friend to volunteer to do that! 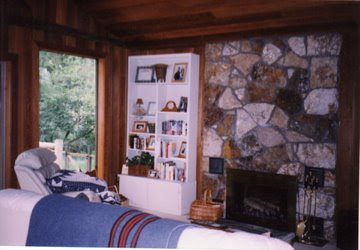 Your home renovation before and afters are so motivational. And you have great vision for putting it all together. A gas insert is the best, isn't it! Although, it's time for me to finish that puppy up (2x4's and insulation aren't as pretty as your river rock).